You're going to work hard with your Raspberry Pi B+. You're going to have to solder, code, and Linux your Maker heart out. 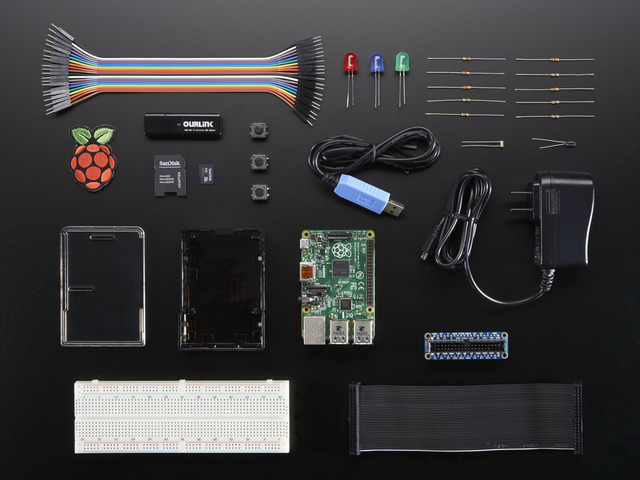 That's why we've tried to make it as easy as possible to start - by combining the Raspberry Pi B+ with what we think are the best beginners' Pi B+ accessories into one easy to use kit. We've hand chosen these accessories as the perfect accompaniment to your new Raspberry Pi Model B+. It's everything you need to get going with a high quality power supply, Raspbian SD card, case, WiFi adapter, console cable, and lots of prototyping essentials. It's a great jumping off point for the rest of our extensive accessory and pack collection. This pack comes with a single Raspberry Pi Model B+ Computer! Adafruit Raspberry Pi B+ Case - Smoke Base / Clear Top - As of 12/1/2014 at 5:30 PM, we are selling the Raspberry Pi B+ Starter Pack with our brand new Pi Case. We think it's the Single Greatest Raspberry Pi Model B+ Case Ever - though our Pi Box Plus is also nothing to scoff at. Adafruit Assembled Pi Cobbler Plus - This is the soldered together version of our popular Pi Cobbler Plus Kit. Comes with a breakout board that's perfect for cobbling prototypes as well as a 40-pin GPIO cable for your Pi's pins. â€‹Full Size Breadboard - In the past, we've used the half-size breadboard for a lot of Pi projects - but no longer! WIth 40 pins to break out, you're going to need some space - and that's why we're including a full size breadboard in this pack. 8 GB MicroSD Card with full PIXEL desktop NOOBS - v2.8- 8GB microSDHC card programmed with the latest Raspberry Pi Linux distribution. 5V 2.5A Switching Power Supply w/ 6' MicroUSB Cable - The 5V 2.4A power adapter is the perfect choice for powering your Raspberry Pi B+ with 2 Amps of current output, and an extra long cord. We're always adding new tutorials to our Learn System but here are a few that are worth checking out to start. While they're for the Model B, they will all apply to the Raspberry Pi Model B+.